Hi all who care for our climate! I am writing this post from Ankara, the capital of Turkey and the heart of Anatolia. Many of you, living in different parts of our delicate world, have seen a serious increase in climate anomalies due to climate change. Here in Ankara, it is now a common thing in our city—which is surrounded by Anatolian steppes and has a limited amount of surface water resources—to have artificial seas and rivers because of heavy rains (see pictures below). Of course there are other aspects to it, such as unplanned urban growth. Nevertheless, with all the disasters, the change in our climate will become a much more serious item on our agendas in the coming years. 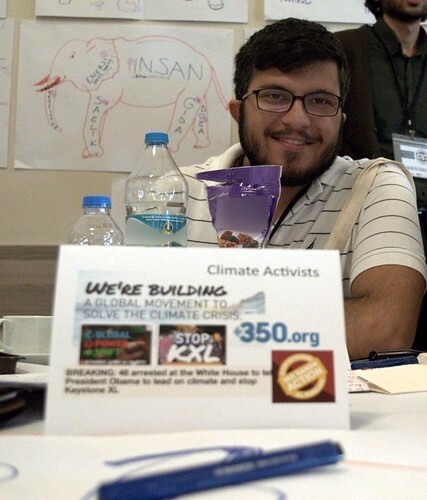 My name is Sarp Çelebi and I took part in the Change4Climate project led by Oguz Tosun, one of Climate Interactive’s World Climate Ambassadors. I am raised primarily under the effect of Turkish culture and I have a bachelor’s degree in environmental engineering. However, above all, I regard myself as a world citizen since I am a member of the Baha’i Faith. Like many other difficulties in our world, climate change is common to all of us and has its root causes in the depths of human mentality. One unpleasant element of our mentality that was also quite evident throughout our World Climate simulation experience is related with the concept of “power”. As we all know, power is a concept that shapes many of our relationships—relationships among individuals, among countries, among citizens, and among governments. It is frequently associated with the notions of contest, division and superiority. This also creates the assumption that all human interactions are driven by a conflict of interest. While we were playing World Climate, each group had a minimal amount of time for concrete decisions, before they were up for their presentations at the end of each round. The rest of the discussions revolved around accusations and defenses. Unfortunately, the current situation of world politics is more or less the same, so the simulation must have motivated us enough to act realistically. 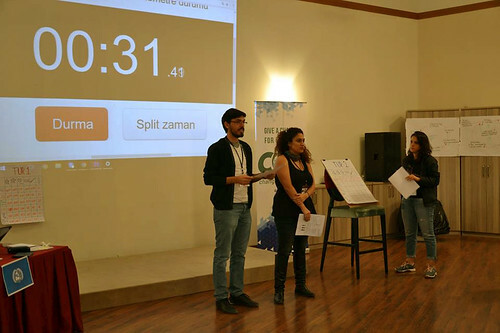 I was lucky to be the climate activist during the simulation, and I must admit, it wasn’t easy at all. I genuinely felt the pressure of being “powerless” as compared with the “big guys” who ruled countries and took decisions. But it was a privilege as a climate activist to be almost completely free and creative in order to inform and convince people. Let us turn back to “power”. Power should not be regarded as a diminishing resource to be seized and guarded. It is a limitless capacity that transforms our reality and it can be used for either constructive or destructive aims. The power that must be sought is one that nurtures, guides and enables people and communities, institutions and leaders to take responsible, positive and constructive action. After all, climate change is a global issue, caused by all of us and cannot be solved unless everybody shoulders fair amount of responsibility. And in this view, there really are no conflicts of interest, since all our shared suffering due to climate change will come to an end once we can control our greenhouse gas emissions. With this in my mind, I have once again learnt that, it is easier said than done. It needs tremendous effort to break habits and start making small changes, both at the level of an individual and as countries. I have learnt to appreciate all the people who participate in finding solutions to climate change, all the way from the brave, restless activists, to the serious, patient bureaucrats who create policies. I have also learnt a lot about how things work at UNFCCC COPs, a lot of very useful terminologies especially, which will make me a conscious and enthusiastic follower of COP 22 to be held next month in Marrakech, Morocco. Before saying goodbye, I must add that I still do not have very concrete plans for taking action. But it is a sure thing that I want to help spreading the cause in Turkey as much as my strength and energy allows me. I want to talk to people and make them feel a similar mixture of worry, excitement and hope that was infused in me during the two days of training. Lastly, to all you friends: Please don’t give up on humanity. We have the power to do better!